After paid parking started in town people began using the Community Center parking lot in Breckenridge. Town officials have been working to enforce parking rules to prevent employees from taking the spots for long periods of time. Many of the residents of French Street in Breckenridge choose the area for its historic significance or family appeal. Therese Dayton said that while growing up, her children used to ride bikes up and down the street. But now, Dayton said that with the increase in traffic and parking congestion on French Street, she’s hard-pressed to picture kids playing in the street without getting hurt. Dayton used to own what is now the Abbett Placer Inn on French. She and her husband bought the property 50 years ago, but subdivided the land to build their home 30 years ago. The inn is now run by Emma and Niels Hagen. Dayton said that because her property is older, it is one of the few to have a driveway leading up to their garage. Even with the driveway, she said that she has difficulties getting in and out because of the high traffic and parking in the area. Annie Harris added that her driveway has been blocked by cars multiple times. Other times, cars are parked too close to the edge of her driveway, making it hard to get in and out. Residents without driveways use street parking in the area. But with the increase of congestion, many are unable to find parking near their homes, which can be difficult for elderly homeowners. The change in parking on French was noticeable as soon as the new paid parking program started in Breckenridge, residents claim. 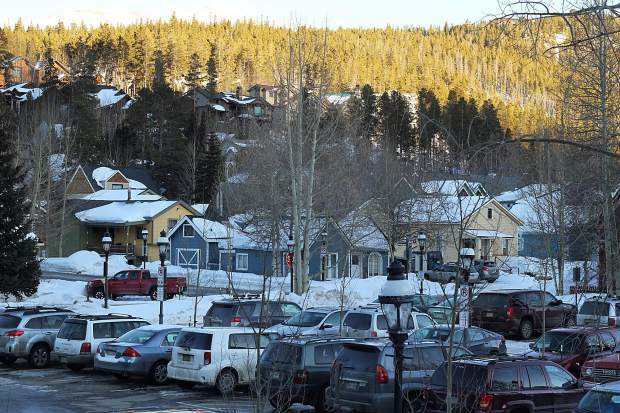 Breckenridge town officials have recently said that the new paid parking system has been effective, keeping spots open throughout the core area. But residents and business owners on French are saying that there’s no longer available parking in their neighborhood. As one of the few free parking areas in town, people have been using the street as a sanctuary in order to avoid the fees downtown. There is a three-hour parking limit on French for regular users. The area has been used for employee parking, but in order to use the spots past the time limit, drivers must have a sticker given out by the town. French is not the only problem to pop up since paid parking was implemented in town in December. The town has moved to try and fight some of the other unintended consequences of the program, such as ensuring that pedestrians have better access to sidewalks and bus stops after heavy snowfall. There were also increased instances of people using business lots as free long-term parking. The people of French Street started an email chain with town staff after the council retreat meeting on Feb. 14. The emails allowed community members to express some of their concerns with parking on French. Kim Dykstra, the director of communications for Breckenridge, said that for the lots, they have posted more signage and begun enforcing parking rules. The town is also working with the neighborhood on French, counting cars and creating a survey for residents. The information will then be presented to the Breck Forward parking task force. She said they are planning on putting all of the information together for a neighborhood meeting at the end of the month. Both Harris and Dayton recognized efforts from the town, and the “thankless” job of enforcing a paid parking program. “I think it has been carefully considered, I just don’t think anybody really expected what was going to be the result of something that’s working in town is now traumatizing our street and our lives,” Dayton said.